Of those who went undiagnosed with ADHD until adulthood, I am one of the lucky ones. I was able to struggle through and graduate from high school and college, I am successful in my career, and I have been married for two years. Even though my life looks great on paper, my entire existence has been a constant internal struggle that has made me seem lazy, flakey, forgetful and irrationally worried. 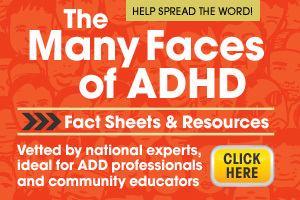 Receiving a diagnosis of ADHD last year was a lifesaver. By learning as much as I can about my disease, I am able to make the connections between the way my brain works and my specific behaviors, and I feel empowered. I didn’t know I had ADHD until I was 29 years old because I wasn’t aware of the range of symptoms. The more we talk about it, the better chance we have to help those who are undiagnosed by showing them there might be something more going on, and that something more can be managed with the right help. Knowing is better, and it’s the first step toward a truly livable life.